TheTasco Target/Varmint 6-24x42mm Rifle Scope with Mil Dot Reticle is the perfect accessory for use on the range, in the prairie, or while out in the woods. With this scope, you can expect long range accuracy that will allow you to hit your mark each and every time you use it. One of the reasons the Tasco Target/Varmint rifle scope is so popular is due to its incredibly affordable price tag. 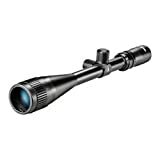 Additionally, the scope offers high-quality and multi-coated optics, a magnification of 6x24x42mm, and the field of view (FOV) of 13” at 6x and 3.7” at 24x. The rifle scope is also designed for use at 100 yards. Each lens in this Tasco rifle scope is coated with Super-Con, Multi-Layered (SC/ML) material for durability and clarity. With a 42mm objective lens, you can expect clear, bright images any time you use it. In addition to the great features mentioned above, this scope has a minute of angle (MOA) windage of 1/4-inch and easy to use elevation adjustments. It will fit nicely on many 16” rifles and won’t weigh you down because it only weighs 19 oz. This Tasco Target/Varmint Rifle Scope offers great value-for-money when you consider its asking price in return for the features it offers. When used solely for target or varmint shooting, you’d be hard-pressed to find any other comparable shooting accessory at the same price. Like any rifle scope on the market, this Tasco product is not ideal for everyone. It’s advertised as a varmint/target scope and stands up to those claims, but has a few downfalls that must be disclosed in order to ensure that no one is left disappointed with their purchase. That being said, it’s important to keep in mind that even with the cons listed below, this rifle scope is still a very affordable option that performs well at its job. Just like the name implies, the Tasco Target/Varmint 6-24x42mm Rifle Scope with Mil Dot Reticle is ideal for target and varmint shooting. Despite some of its cons, it will do a good job if you’re using it on a target or varmint rifle. It will be challenging to find anything else that does a better job at this price range. So, if this is a scope that you’ve been keeping an eye on, go ahead and pick it up – you’ll be glad you took the plunge. The scope offers all the features you’ll ever need to target shoot or get rid of varmints, and you don’t have to go broke to get it. While no one is going to argue that this Tasco scope doesn’t offer some of the finer features of a Leupold scope or other elite brands out on the market, no one is denying that it’s the perfect scope for target shooters on a budget.